We at Deckstainhelp.com appreciate your loyalty. It is our commitment to remain your number one source for deck staining tips and latest industry news on the internet in 2019. Sherwin Williams SuperDeck continues to follow same wear trends and issues with turning black as years before. Leave us a comment if you’ve used Sherwin Williams SuperDeck and let us know how your projects held up. Note: Sherwin Williams bought Super Deck in 2013. This review is for the original SuperDeck Oil-Based semi-transparent formula. SUPERDECK® by Sherwin Williams is a professional grade exterior wood deck finish that was developed to provide superb weather protection and color enhancement. Superdeck semi-transparent deck stain utilizes iron oxide pigments to protect against harmful UV rays. Superdeck is a blend of tung and linseed oils to help inhibit the growth of mold and mildew. A high-solid wood finish developed to give superior protection and beautiful color to exterior wood. Superdeck® Semi-Transparent Stain uses the highest quality ingredients to provide superior protection. This unique formula contains carnauba wax for an extremely durable finish and a beautiful lustrous sheen with mar and scuff resistance. Superdeck® Semi-Transparent Stain will not track and is resistant to foot traffic patterning. Superdeck® Semi-Transparent Stain is expertly formulated for any exterior surface including decks, fences, siding, and furniture. Available in a spectacular 63-color palette to capture the beauty you seek. –Our test deck was a cedar deck. We chose to use the Superdeck cedar color. Unfortunately, after drying the finish was a tacky uneven finish that did not dissipate for several days. A single coat of stain was applied. We appreciate you visiting Deckstainhelp.com as we continue to be your go-to source for the latest in deck restoration news and trending topics through 2019. Below, we talk about Why Deck Stains Turn Black. Feel free to leave a comment below with any pictures you may have. Why Did My Deck Stain Darken or Turn Black? There has always been some concern for deck owners as to why a deck stain can darken or turn black in color after a couple of years. 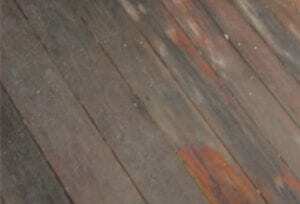 There typically are a few reasons why this may occur for any brand of deck stain. When a deck stain does not cure or dry properly it can remain tacky for longer than it should. This can result in embedded dirt, grime, and/or tree pollen. These trapped contaminants can have an increased effect on mold and mildew growth darkening the deck stain. Improper curing usually happens from over applying the stain. In very hot and humid climate types, mold and mildew can actually begin to form on the surface of a deck stain causing it to appear darker. In extreme cases, mold and mildew can grow below or in the stain, further darkening the appearance. We would love to hear from you if you have used the SuperDeck Stain from Sherwin Willaims on your wood or deck. Please post a rating in the Consumer Star Ratings below. Consumer reviews below in the comment section have shown lower than average results when using the SuperDeck Stain. If you have any pictures of your experience with SuperDeck Stain, you can add them in the comment area with a detailed description. If you have used the SuperDeck deck stains, please post a review and any pictures in our comment area below. A short description of your experience would help. The DuckBack company is the original manufacturer of Super Deck and was purchased by Sherwin Wiliams a few years ago. The Super Deck brand has gone through numerous changes since. Sherwin Williams has kept the SuperDeck brand but has added their old Deckscapes formula into the Super Deck lineup. They now have an oil based and a water-based version. This review of the Super Deck would be comparable to the current oil-based formula of the new label of the SuperDeck, under Sherwin Williams paint brand. The current Sherwin Labels Super Deck that is water based, would be comparable to our review of the Sherwin Williams Deckscapes. SUPERDECK® Semi-Transparent Stain is a 70% solid, pro-grade, wood deck finish developed to give superior protection and enhanced color to exterior wood. 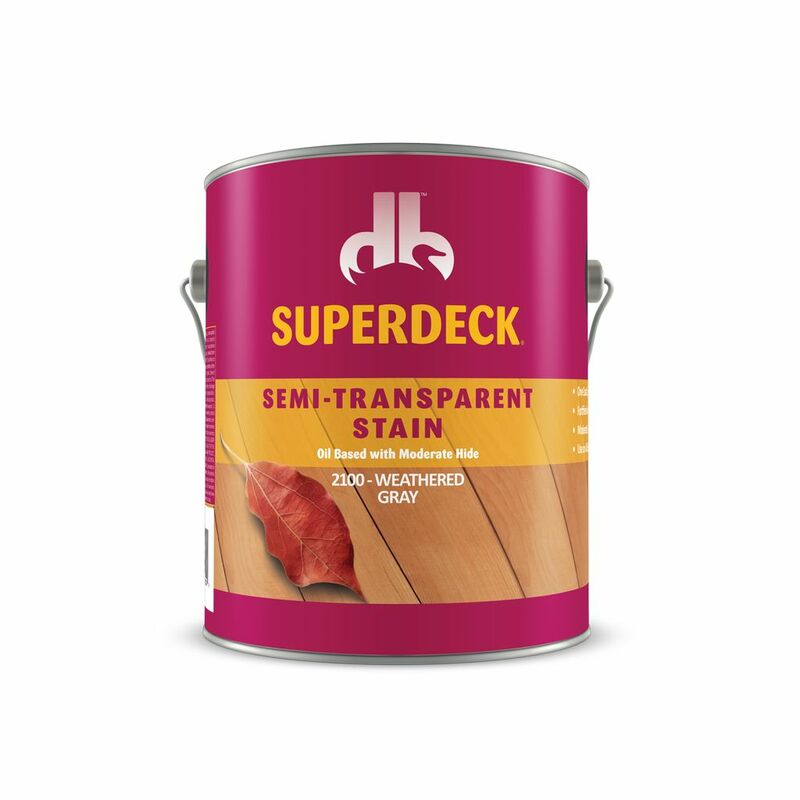 Superdeck Semi-Transparent Stains uses iron oxide pigments to prevent UV damage. Containing tung and linseed oils that provide superior protection with mildewcides that inhibit the growth of mildew. Superdeck Semi-Transparent Stains contain Carnauba for a durable finish that is scuff resistance. – We used the Superdeck Stain in the redwood color on a newly built redwood porch in Northern California. The final appearance after drying was a sticky uneven finish on our porch. The stain did not penetrate very well into the wood even though the Superdeck cleaner and brightener were used to prep prior to application. Only one light coat was applied. – 80% of the initial color was left after 2 years of exposure in full sun. The Superdeck did score fairly well here. – The was no peeling of the Superdeck Semi-transparent stain but there was wearing in the high traffic areas. This porch is the entrance to the home and the Superdeck was completely worn from the stairs to the door.